For all inground pools. Works without a booster pump. 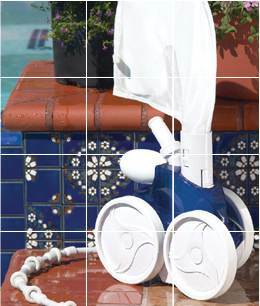 Our most advanced pressure-side automatic pool cleaner that operates without a booster pump. The Polaris® 360 easily connects to a dedicated pressure line and is suitable for all in-ground pools. It sweeps, scrubs, and vacuums all surfaces of the pool. It also traps large debris like leaves and pebbles in its own filter bag. The Polaris® Vac-Sweep 360 features advanced technology cleaning without the need for a separate booster pump. • Also available in a Black Max Model to complement dark bottom pools.